The example of collected data through this feature is, the type of device’s hardware used or application installed and its usage details and like this. Sometime the data which isn’t telemetry is also send to Microsoft like user’s current location searches of Bing, Wallpaper or Screen Savers etc. so, users want to disable this Telemetry and data Collection feature because they don’t want to let Microsoft to have any of their information. 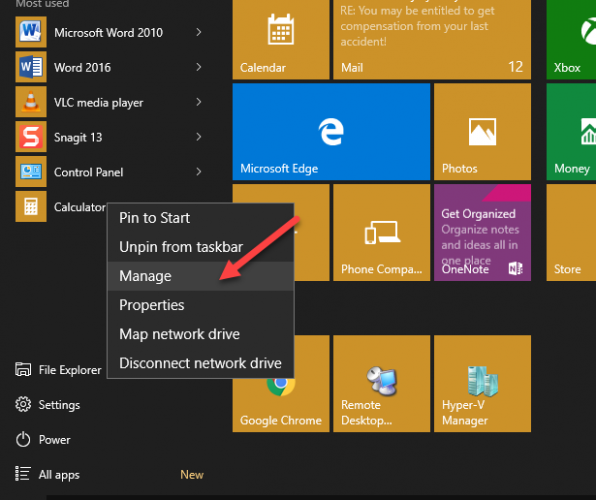 Apply following steps to make this feature disable and don’t let Microsoft to get your any information. 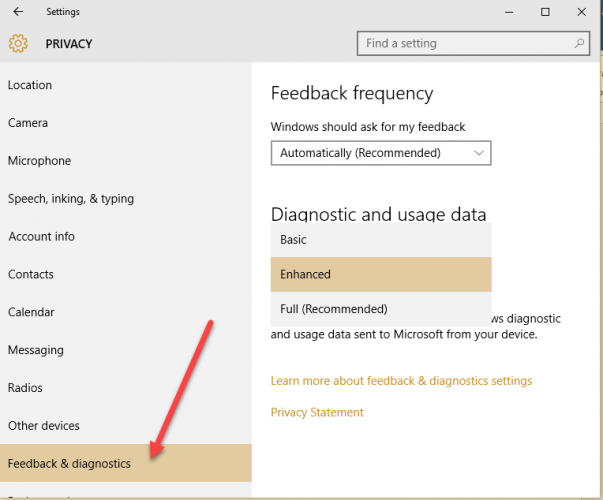 For Windows 10 users, go to Settings –> Privacy –> Feedback and Diagnostics. There you may see three options for “send your device data to Microsoft”. Enhanced: This is Basic data plus data about how you use Windows. Which apps you use frequently and all that. Full(recommended): This is Basic data plus Enhanced data and it includes advanced diagnostics feature by turning it on to send extra data from your device. As you can see clearly, there isn’t any option to make it disable directly. 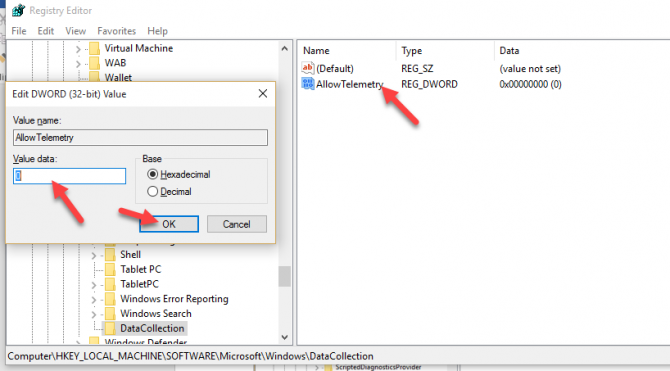 So, for users who don’t want their activities to send to Microsoft, they want this Telemetry feature disable. For this, users need to make change in Registry. Open Registry Editor by typing “regedit” in Run dialog. And go to following Entry. 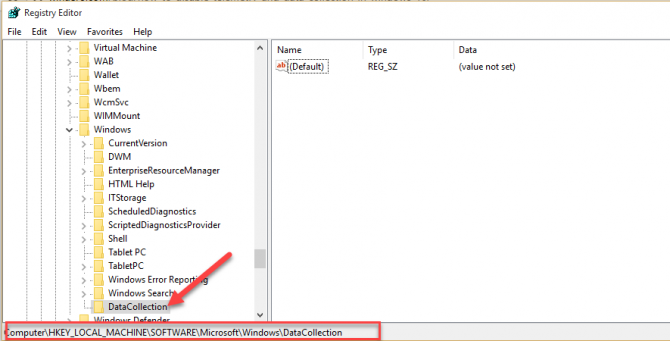 If you don’t have any such entry, just create it, new key value by right clicking on Windows and named it “DataCollection”. And then what’s next? now you have to create a DWORD value of 32-bit in DataCollection and name that DWORD value as AllowTelemetry and set its value to 0. So far you are done with Registry entries. Next, you have to disable few services of your System. For this Right click the “File Explorer” and go to “Manage”. Then go to “services and applications” and then “services”. List of all services will open in front of you. And make the service disable “Diagnostics Tracking service”. 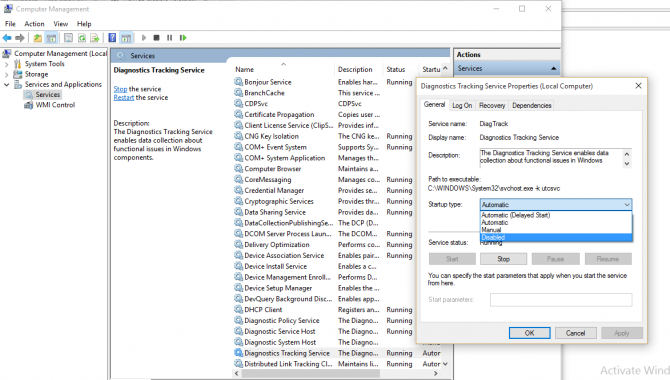 If you are using updated Windows version 1511, then the service name “Diagnostics Tracking service” has been replaced by “Connected User Experiences and Telemetry”. In that case, make it disable. To apply all this changes, restart your System once after saving all the changes. On next restart of System, the changes will be applied to your Registry settings and now your any information of device or any activity won’t be accessed by Microsoft. Doesn’t work. Win 10 automatically restarts this service. Version 1703 (os build 15063.966.